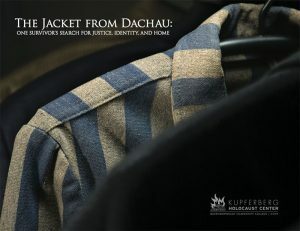 “The Jacket from Dachau: One Survivor’s Search for Justice, Identity, and Home” Libguide was selected as the 2017 winner of the ReferenceUSA Award for Excellence in Reference and Adult Services for its well-organized and accessible presentation of information about the Holocaust. Spearheaded by librarians Leslie Ward and Christine (Mi Seon) Kim of the Kurt R. Schmeller Library, Queensborough Community College, New York, “The Jacket from Dachau” Libguide was developed to accompany the exhibition at the Kupferberg Holocaust Center of Queensborough Community College. The exhibition focuses on the jacket worn by Benzion Pereseck, a 15-year-old Lithuanian boy, during his time at Dachau Concentration Camp. Themes of justice, identity, perseverance, and home are woven throughout the exhibit evoking an emotional, historical narrative. The Libguide includes links to print, online, and video resources that place “The Jacket from Dachau” in context among other Holocaust resources. Using timelines, maps, photos, and infographics, the guide provides students, faculty, and other exhibit viewers a unique, immersive and interactive perspective of Holocaust history. Sponsored by ReferenceUSA, the authors will receive $1,500 and a citation which will be presented to at the RUSA Achievement Awards Ceremony at the ALA Annual Conference in Chicago in June. The ReferenceUSA Award for Excellence in Reference and Adult Services selection committee includes: Susan Beck (Chair), Phillip Ballo, Rebecca Jackson, and Suzanne Odom. The RUSA Achievement Awards Ceremony and Reception will be held from 5-6:30 p.m. Sunday, June 25 at the ALA Annual Conference in Chicago. All conference attendees are invited to the event. Additional event details will be available on the conference website in April.